In a span of one year, Marc and I have traveled quite often. Probably more often than I ever did during my teenage years 😀 Juggling such travels with work makes it even more excitingâ€”keeping us sane and inspired since we don’t get cooped up in our home office far too long. One of the Philippine destinations I’ve wanted to visit is Batanes. I’ve heard a lot about Batanes. I’ve seen pictures of rolling hills reminiscent of the Sound of Music (or, if you’re carrying a buttload of ancient cameras like Juned was, a reminiscent of the Lord of the Rings LOL). Either way, merely seeing photos of Batanes’ green pastures and pristine beaches, I can’t help but feel my domestic travel adventures won’t be complete without seeing this flourishing nature for myself. 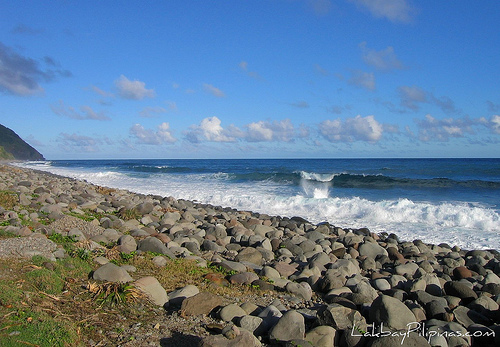 By next week, I will have my own photo of Batanes to post in my blog. I wouldn’t need to steal from Melo anymore (oh, that photo was stolen with his consent, so if you’d like to use it, contact him first). Thanks to SEAIR, Marc and I will be joining our favorite travel buddiesâ€”Nina, Eric, Melo and Karlaâ€”on an exciting adventure to the Philippines’ northernmost province. Hopefully, I’ll have more materials for my newly created travel blog, Filipino Traveler. This entry was posted on Saturday, 8 November 2008 at 1:51 am and is filed under Travel. Share your bag story, win a Hedgren bag! oh enjoy yourselves! It is good to travel. Hubby and I will follow soon.